The company is turning to tech to get ahead of the competition and scammers. Buying limited-edition sneakers, like Kanye West's Yeezys, isn't easy. Whether they drop on a site, in an app or a brick-and-mortar store, they often sell out in minutes, sometimes seconds. This sense of scarcity is what's behind the growth of secondhand online sellers such as StockX and GOAT, where you can find basically any hyped shoe that's ever been released by Adidas or Nike... for a premium, of course. What makes these sites popular is that they guarantee authenticity. With StockX, for instance, any pair you get from it comes with a QR code verification tag, but that's only for internal use. GOAT, meanwhile, sends you a letter saying the shoes have been authenticated. But these are decidedly low-tech and not particularly transparent solutions. Sneaker Con, a company that hosts conventions for sneakerheads all over the world, is hoping to add a 21st-century twist to the authentication game. 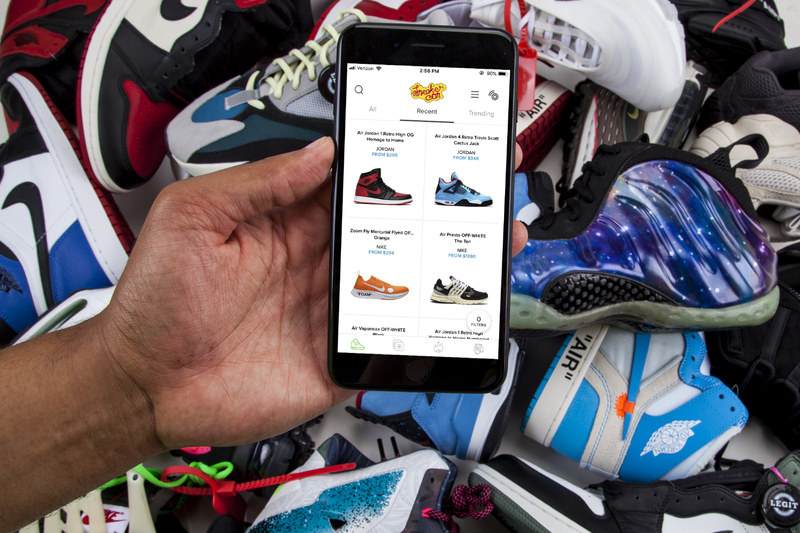 Sneaker Con is launching an app where people can buy and sell shoes (new or used), similar to StockX and GOAT, with support for a technology that'll make it stand out from the rest: near-field communication (NFC). Every time you buy a pair from the Sneaker Con application, it'll come with a physical tag attached to the shoes that features NFC. This Legit Tag comes loaded with information about the sneaker you're getting (including the model name, size, condition and SKU number). To see that, all you have to do is open the Sneaker Con app and tap the authentication tab: A window will pop up telling you it's ready to scan your shoes. Then you just touch the top of the phone to the Legit Tag, and if it's authentic, you'll get a screen that says your pair is "Legit. Sneaker Con Authenticated." 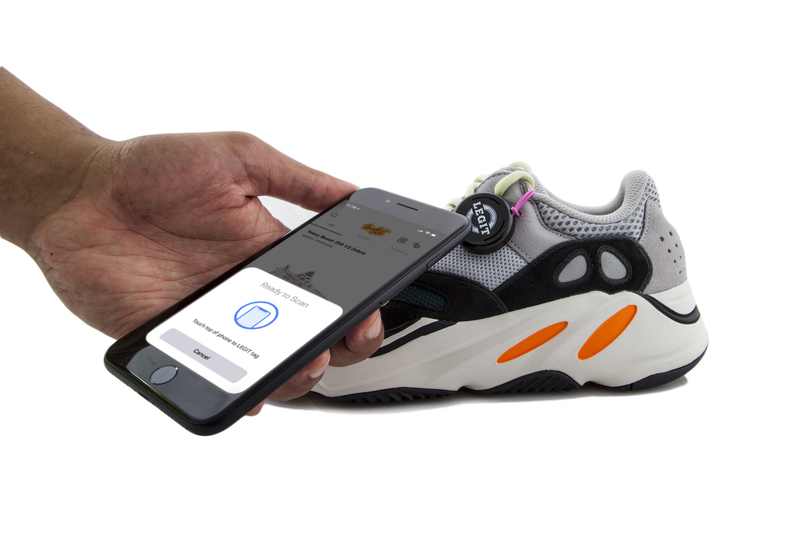 While Sneaker Con designed the Legit Tags in house, the user experience was created in partnership with Blue Bite, a startup that's using NFC to offer authentication services for brands such as Adidas, Bulgari and Pinko. Blue Bite's software is what makes Sneaker Con's NFC tags secure and keeps them from being faked. It uses its proprietary technology to create a unique authentication ID every time there's a "transaction," aka a scan between the tag and the phone. This makes them basically impossible to copy. 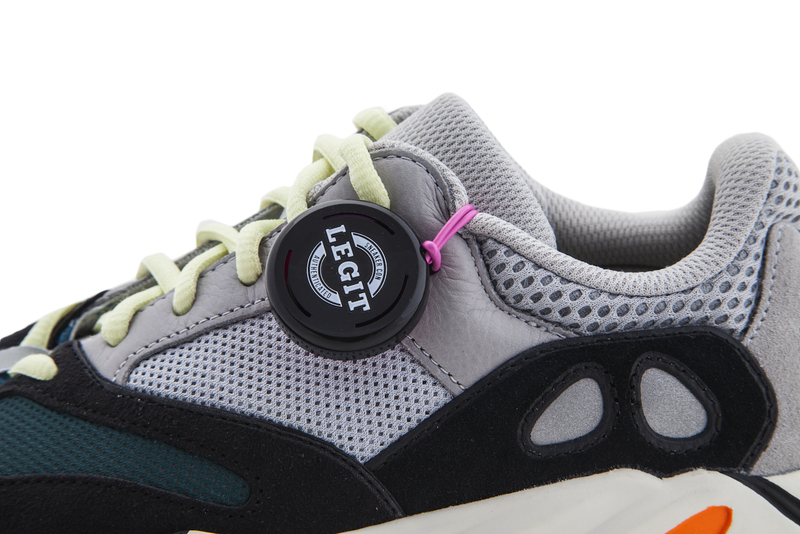 Physically, the tags are attached to the sneaker through a shoelace hole, and they can only be removed with a pair of wire cutters (in the future, there will be a version that'll only require household scissors). So if people wanted to put one on a fake pair, they would have to completely cut it off from a shoe, making it obvious that it had been tampered with. The Legit Tag can still be scanned once it's removed, since the wires are just there to be knotted and tied to the shoe, but Sneaker Con recommends that buyers beware of any signs of tampering if they buy a pair from someone outside the app. For sellers, the company will act as a middleman, charging an 8 percent fee. When someone purchases a shoe listed on the app, the seller has to send it to Sneaker Con to be authenticated and then shipped to the buyer. If a pair arrives and happens to be fake, Sneaker Con will then send it back to the seller and won't charge the buyer. People can also take pairs to any of the 16 Sneaker Con events held around the country every year to have them authenticated for free. (Well, free with the price of admission, at least.) This is going to come in handy for sellers who want to get rid of pairs locally, since the Legit Tags will let buyers instantly figure out if the pair they're buying is the real deal. Beyond that, if your pair already has a Legit Tag on it, the app has an option to let you verify it and ship directly to the buyer. That's not something you can do on StockX or GOAT, but Sneaker Con is able to do this thanks to the NFC-powered system it's built. Alan Vinogradov, the company's CEO and founder, told Engadget that this has been in the works for three years. He said the hardest part was creating a database for thousands of shoes, as well as training his staff to understand that people's trust in the authentication method is what will make or break the company. Vinogradov said this is particularly challenging at a time when fake sneakers are sometimes "95 percent" close to the real thing, so Sneaker Con's authenticators have to learn the ins and outs of every shoe that comes in -- from ink markings that can only be spotted with black lights to down-to-a-millimeter measurements. Down the road, Sneaker Con's plan is to make the most out of NFC by adding extra functionality to the Legit Tags. Vinogradov said that will include videos explaining the authentication process as well as location-based alerts such as telling a user when there's a Sneaker Con event nearby. This content would be available to anyone with access to a Legit Tag. Right now, though, Sneaker Con says the main focus is to perfect its NFC-based authentication and bring peace of mind to sneakerheads. Nike is another company that's been attaching NFC tags on products, but they weren't designed to be an anti-counterfeiting measure. Instead, the NikeConnect NBA Jersey gives people access to exclusive goods such as limited-edition shoes or videos and pictures from their favorite team. Adidas, meanwhile, embedded an NFC chip in its 2018 World Cup ball, the Telstar 18, which not only delivers exclusive content but also serves to authenticate it as the real deal. NFC presents a great chance to give consumers a digital window into the sneaker culture, Vinogradov said, beyond being used simply as a tool for legitimizing products. "NFC isn't only a symbol of authentication," he said, "but it's also [an opportunity] to learn more about the shoe." At launch, the Sneaker Con app is only available for iOS, but Vinogradov said there are plans to roll out an Android version in a few months. And if its Legit Tags catch on, Sneaker Con's tech could make a real difference in an industry that's historically been plagued by fakes.